The majority of villages in Cambodia have at least one person presently living in Phnom Penh. If we reach Phnom Penh with the Gospel, then those we reach can go back and tell the people in their home villages about the Light of God’s Word also. Therefore, New Hope Baptist Church in Phnom Penh has a vision to see our church members plant churches throughout the countryside of Cambodia. The tithes and offerring from the members of New Hope Baptist Church are used to support two church planters at $65 a month each. This support helps cover most of their ministry expenses but does not cover what these men need to support their families. 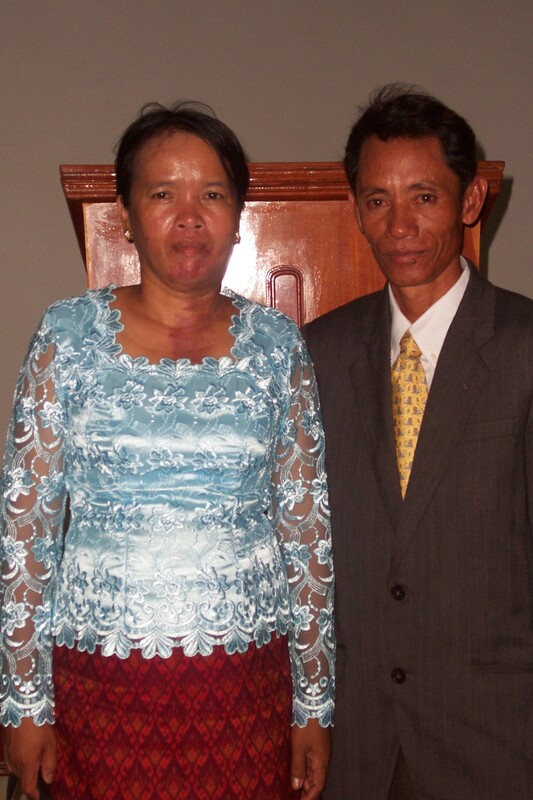 Kem and Pao were the first married couple to be saved and baptized into New Hope Baptist Church. 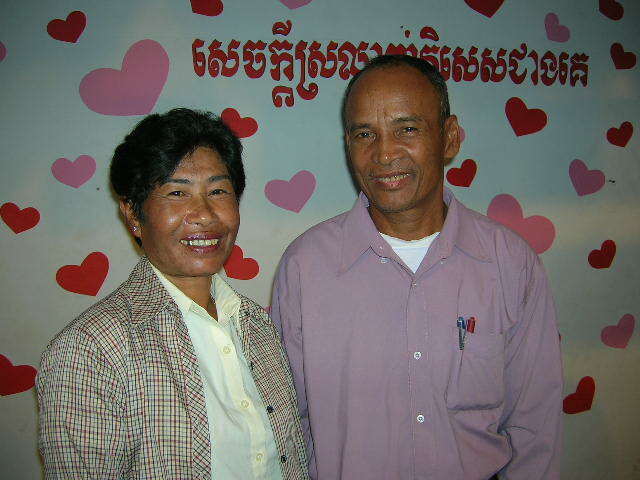 Presently, they both attend S.S. and church on Sunday mornings and then drive 80 km south to their home village of Jeoung Jap. They do the work of the ministry there for 3 days and two nights before they return to Phnom Penh. New Hope Baptist Church has supported Kem since 2003. Soon we plan to develop a page that gives more details about Kem, his family, and the work God is using him to do. 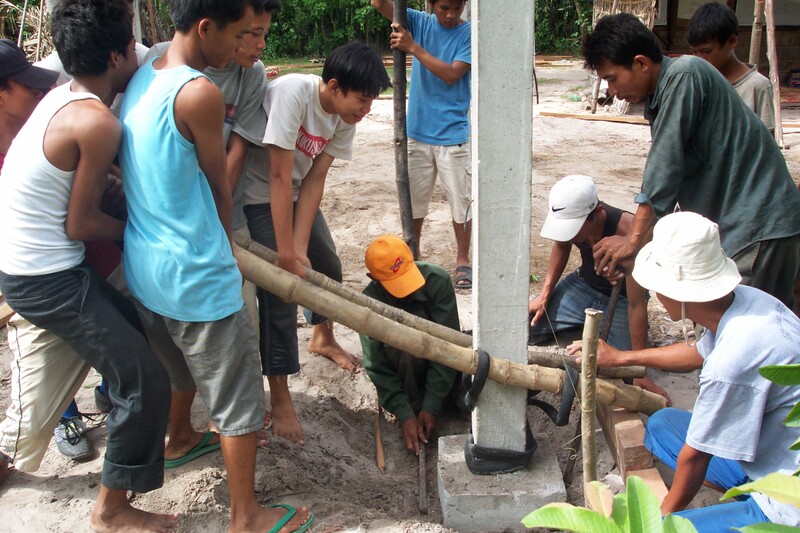 In 2005 New Hope Baptist Church gave all the funds and provided all the labor to construct a simple meeting place for the church in Jeoung Jap. Sakaun and Samaat first came to our church as visitors to our Christmas play in 1998. 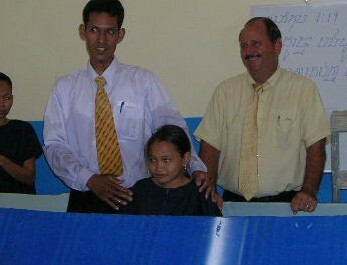 By March of 1999 Sakaun and his family had accepted Christ and obeyed the Lord in believer’s baptism. Presently, Sakaun and his family attend as well as serve in the Sunday School and Sunday morning services. Then they head home, 30 km southwest, to their own village to hold services there. Lord willing, we will be adding a page to detail the life and ministry of these wonderful people. 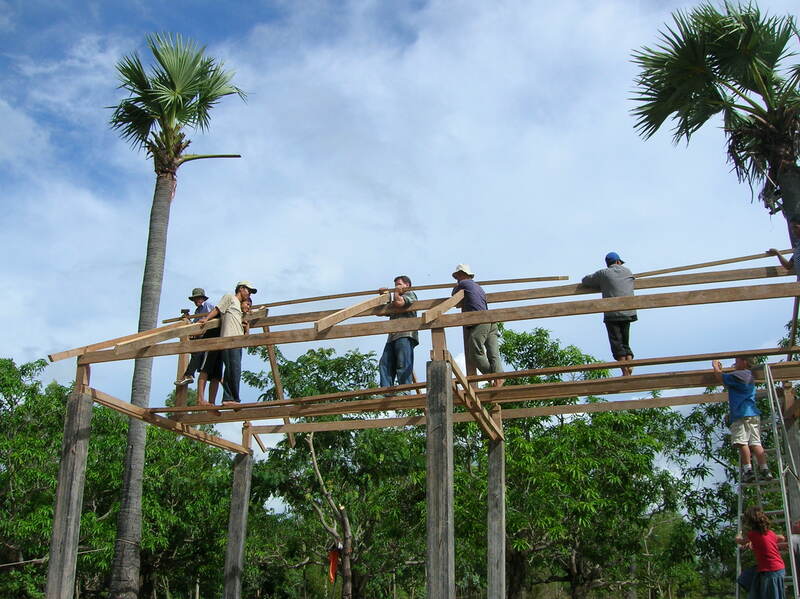 In 2004, God gave us the opportunity to start a new ministry in Bung Leach Village of Ta Keo Province. By 2006 New Hope Baptist Church had saved enough money to buy a piece of property in this village. After one more year the church had save enough money to build a meeting place much like the one in Jeoung Jap Village. This time, some of the men from Jeoung Jap Village came up to help the members of New Hope with the contruction for this mission work. As a young single man, Proh accepted Christ in our ministry in 2001. He grew closer to the Lord and closer to Chenda, Sakaun’s daughter. They were married and now serve God together in the city of Ta Kmaw. As pictured below, Proh is working with Missionary Ray Shull. Ray and Proh have been doing a great job planting the Liberty Baptist Church since 2007. Proh continues to come to our institute and help Sakaun with the work in Bung Leach. Please pray for New Hope Baptist Church to continue to expand their vision, their sacrifice, and their work for the Lord Jesus Christ.